We’ve been working on it for months and now it’s finally in beta: the new WebOMR service. 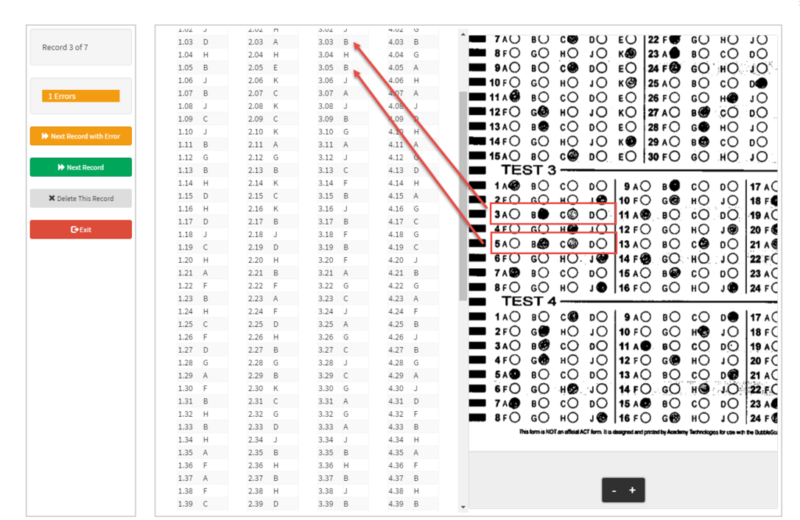 WebOMR is the part of our solution that reads scanned answer sheets and extracts the marked bubbles on it. For the next several weeks we will run the old WebOMR and the new one (we are calling it WebOMR2, I know it’s ingenious) side by side. Click on the green ADD FILES button to upload files. 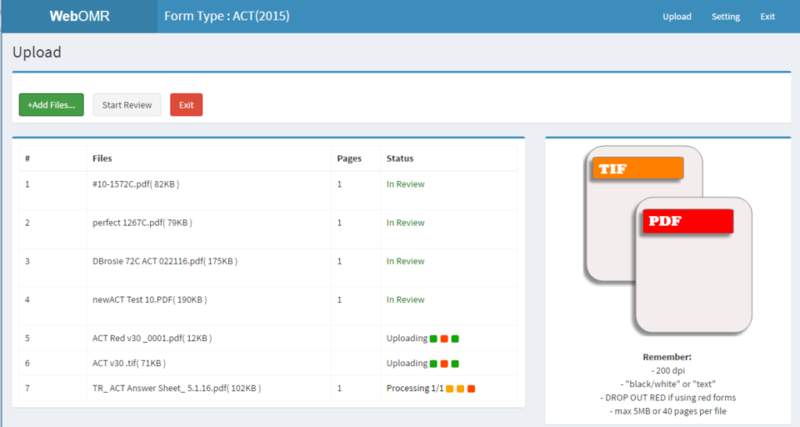 When ALL files have been processed and are IN REVIEW, you can click the START REVIEW button. The Review works the same as before with just a slightly different interface. We tried to be a little clearer about what pages require review. I hope it’s clear to you from the screen shot below. As before, you review by clicking on the line of the individual page. Items we saw as errors will be highlighted in red. All fields can be edited by simply typing the new value into the respective field. We are using our new DARKEST BUBBLE feature now. As you can see in the in the image below only the darkest mark is reported when more than one mark is detected. Try submitting only one page of a SAT or PSAT and make note of the warning that you are missing a page! When pages are submitted for grading, WebOMR remains open – with all files still in the REVIEW list. 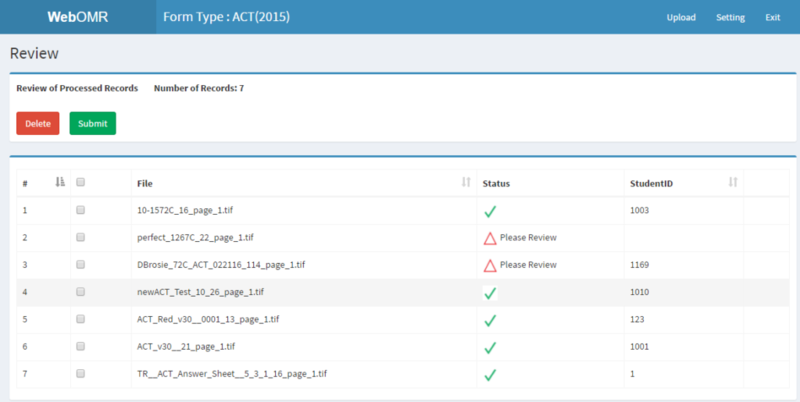 This allows you to fix things like a wrong test ID that won’t get detected until we actually grade the test, without having to repeat the entire process starting with the uploading of scanned answer sheets. This is a bit of a temporary situation. Right now you can change any student response and even the student ID after grading. You can’t change the test ID after grading without having to restart the entire uploading and review process. We intend to change that in the near future and plan to then close down WebOMR automatically. If you have any feedback on that matter, I’d love to hear it. In cases where the default sensitivity settings in conjunction with the new DARKEST BUBBLE feature doesn’t suffice, you can now change the sensitivity settings. Please note that you will need to repeat the upload process after changing the settings. For this first week, WebOMR2 is using a beta version of the OMR engine that is not hosted on the same server as the regular OMR engine. We are beta testing the ‘darkest bubble’ feature for a week. Processing takes a little longer on that server. We intend to update the main OMR engine with the ‘darkest bubble’ feature right after Thanksgiving so that this feature will be available for both the current WebOMR and the new WebOMR2 services. As planned, on Nov 7th, 11pm, we moved our domain from Prep.BubbleScan.net to OnlineScoreTracker.com. Please update any links you use or share with students to the new domain. If you are using a hosted log in panel on your site – please refer to TOOLS – SITE ACCESS OPTIONS in your OST account for an updated code snippet. The site has an updated user-interface. Nothing that would require you to learn anything new, just some fresh paint! The biggest change is that we now support a username for students. In the past, students had to use their numeric student ID to log in. They can still do that. But in addition, they can also use a username now. The username can be up to 30 characters. 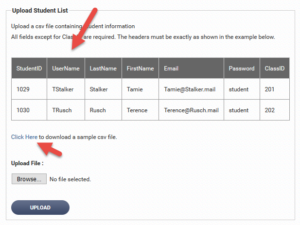 By default we have set the username to be the numeric student ID, but you or even the student through their student portal can change the username (not the student ID, but the username!). 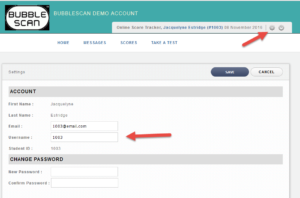 If you are using our API to automatically create student profiles in your OST account, please refer to TOOLS – PREFERENCES for details about the using the new URL (basically you just need to replace Prep.BubbleScan.net with OnlineScoreTracker.com, and add the username field in your code). Students can now change their username and also their email. Clicking on the gear icon in the top right hand corner of their student portal will give them access to that.